Are Your Hips Flexible Enough for Golf? A study published in the June 2007 edition of the Journal of Strength and Conditioning Research found that plus handicap golfers had significantly more flexible hips than golfers with handicaps of 10-20. Another study, published in the March 2004 edition of the American Journal of Sports Medicine found that professional golfers with low back pain had significantly less internal rotation in their lead hip than golfers with no back pain. Are stiff hips hurting your back or golf game? It's easy to find out with our simple hip measurement test for internal hip rotation. Lie on your stomach on the floor and bend both knees 90°. 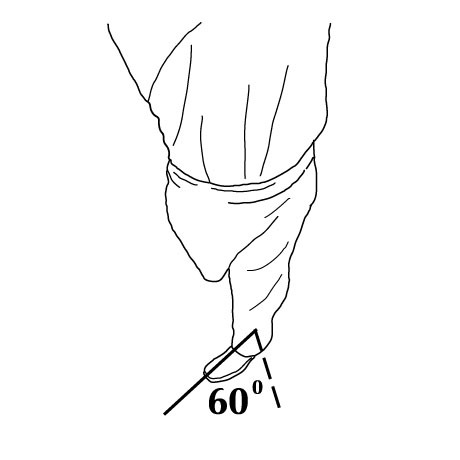 Keeping your knees together, move your feet apart, as you see in the illustration. Now have someone get down on the floor and take a photograph of the V formed by your lower legs. If you have an iPad, you can download a simple app—Tap2Measure—to easily measure how many degrees of internal rotation you have on each hip. If you don't have an iPad, just print a photo of your lower legs and use a protractor to measure. Draw a line through the center of each lower leg, and a vertical line through each knee. Then measure how many degrees you have on each hip. You need a minimum of 60° of internal rotation on each hip to play your best golf. 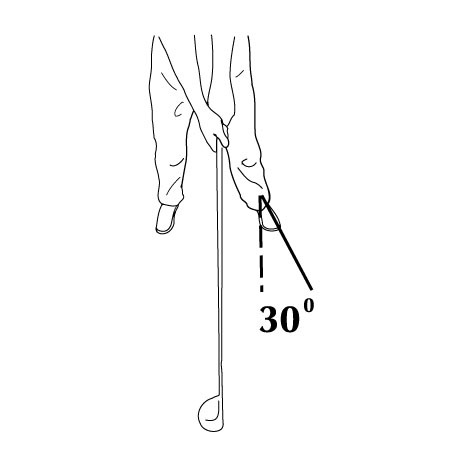 For instance, most golfers stand at address with their lead foot turned out 30°. They finish their swing with their hips square to the target. At this point, their lead hip is turned in 60°. If you have less than 60° of internal rotation on your lead hip, your hips will stop rotating prematurely after impact, but your upper body, which is holding onto a driver going 100 mph and pulling away from you with 100 lbs. of force, will keeping turning and all the stress will go directly to your lower back. This is why conventional treatment for low back pain in golfers is not very successful—it concentrates on the lower back, while the cause is usually in the lead hip. If you don't have at least 60° of internal hip rotation on your trailing hip, you will need to expend a lot of energy trying to turn your hips away from the ball. We know that a restricted hip turn is fashionable in golf right now, but don't tell that to the long hitters. They are able to generate large club head speeds by increasing their hip turn on their backswing. A good example is college player David Huertas, who increased his hip turn on his backswing from 45° to 60° after we released microfibers that were restricting his hips. He also increased his average drive from 290 to 350. This is his internal hip rotation before and after Microfiber Reduction. David lost hip flexibility from falling on his hips while playing soccer when he was very young. But more importantly, he lost more flexibility in his hips, back and shoulders from lifting weights. The loss of flexibility from lifting weights pushed his scratch game into the 90's. He was fortunately able to get back down to a 1.5 index after we released the microfibers caused by soccer falls and lifting weights. Here is a short interview with David on the loss and ultimate recovery of his handicap. Here is a video of an actual Microfiber Reduction session with a 21 year-old golfer, who also lost flexibility from lifting weights. Since falling on the hips and lifting weights both create microfibers, or mild scar tissue, in the connective tissue between the hip muscles, we don't find that stretching does much to improve internal hip rotation, as you cannot release scar tissue with stretching. If you want to try stretching anyway, we recommend the new DVD Are You Flexible Enough for Golf? It has two stretches for internal hip rotation depending on how much flexibility you have lost. You can learn more about Microfiber Reduction at http://www.somaxsports.com/microfiber.php.